A pilot died in the crash of a home-built plane at an Ellis County airport on Saturday afternoon. Lynn Lunsford, Mid-State Public Affairs Manager for the Federal Aviation Administration said the crash happened around 4:40 p.m. at Mid-Way Regional Airport in Ellis County. 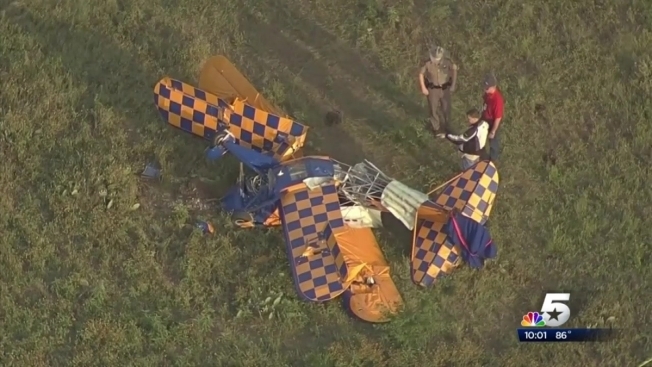 The aircraft involved in the crash is a single-engine home-built Skybolt biplane. Law enforcement told the FAA that the pilot died in the crash. Their name has not been released, but Department of Public Safety State Trooper James Colunga says the pilot/builder of the plane, who is also the crash victim, is from the Arlington area. Lunsford also said witnesses claim the plane was performing aerobatic maneuvers over the runway when it crashed. Tracy Gilby from the Waxahachie area said she and her son saw the plane in the sky and pulled over near the airport to watch it. "We saw the airplane doing tricks so we kind of slowed down to watch him and then he just kind of spiraled down,” said Gilby. She said when emergency vehicles began rushing by into the airport all they could do was pray. FAA investigators are headed the crash site. The National Transportation Safety Board was also notified of the accident. Family of the victim have been notified and were also at the scene Saturday night but declined to speak to the press.